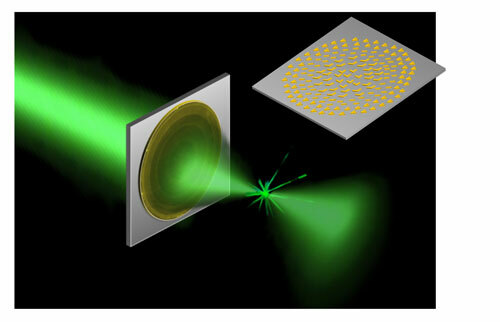 (Nanowerk News) Applied physicists at the Harvard School of Engineering and Applied Sciences (SEAS) have created an ultrathin, flat lens that focuses light without imparting the distortions of conventional lenses. Operating at telecom wavelengths (i.e., the range commonly used in fiber-optic communications), the new device is completely scalable, from near-infrared to terahertz wavelengths, and simple to manufacture. 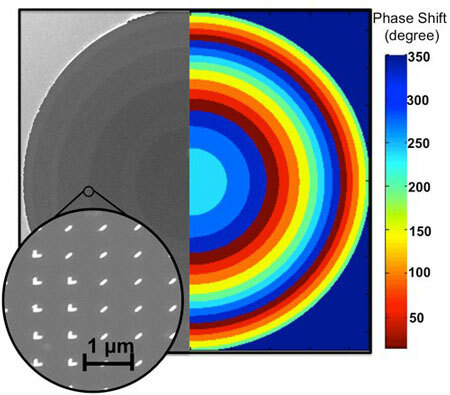 The results have been published online in the journal Nano Letters ("Aberration-Free Ultrathin Flat Lenses and Axicons at Telecom Wavelengths Based on Plasmonic Metasurfaces"). Capasso and his collaborators at SEAS create the flat lens by plating a very thin wafer of silicon with an nanometer-thin layer of gold. Next, they strip away parts of the gold layer to leave behind an array of V-shaped structures, evenly spaced in rows across the surface. When Capasso’s group shines a laser onto the flat lens, these structures act as nanoantennas that capture the incoming light and hold onto it briefly before releasing it again. Those delays, which are precisely tuned across the surface of the lens, change the direction of the light in the same way that a thick glass lens would, with an important distinction.